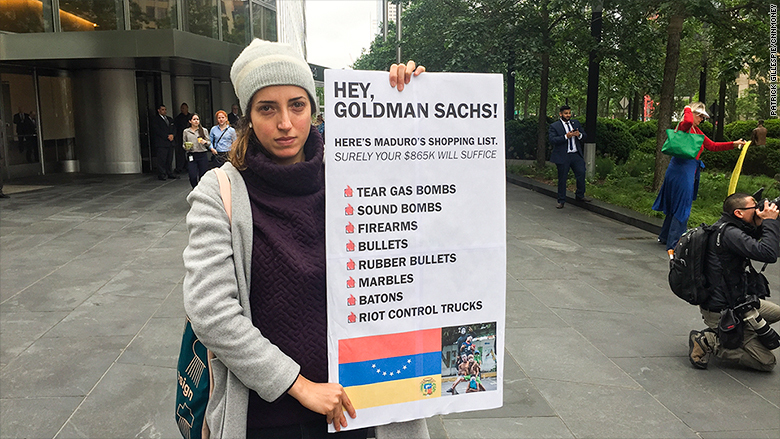 Venezuelans are furious with Goldman Sachs for buying the country's government bonds last week, which critics say gives a lifeline to an incompetent government that is starving its people. Goldman confirmed the purchase Tuesday morning after the Wall Street Journal first reported it. Goldman stands to make a nice profit from the purchase. It allegedly paid just 31 cents on the dollar, or $865 million, for bonds that were originally worth $2.8 billion. In other words, it got a huge discount on the bonds that pay a high return. Goldman Sachs defended its action, saying it bought the bonds -- issued in 2014 by state-run oil company PDVSA -- with the hope that life in Venezuela will improve. The value of the bonds would then rise too. "We are invested in PDVSA bonds because, like many in the asset management industry, we believe the situation in the country must improve over time," Goldman (GS) said in a statement. Related: Thousands of Venezuelans are fleeing to the U.S.
Goldman bought the bonds from another broker and says it didn't interact with the Venezuelan government. But the government seems to have already benefited from an increase in reserves and some Venezuelans are livid at Goldman's decision. Venezuela's top opposition leader and president of the National Assembly Julio Borges fired off a letter to Goldman Sachs CEO Lloyd Blankfein saying he was concerned and "outraged" that the investment bank had bought the bonds. 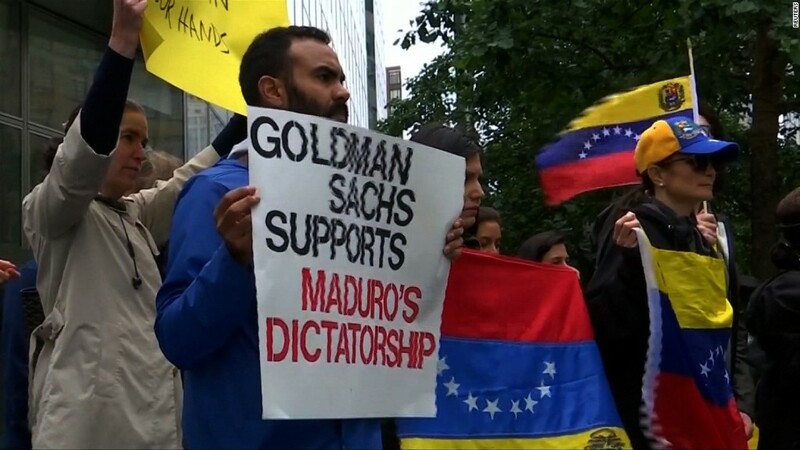 "It is apparent Goldman Sachs decided to make a quick buck off the suffering of the Venezuelan people," he said. Esther Beke protested outside Goldman Sachs' New York office on Tuesday. A group of nearly 30 protesters gathered outside Goldman Sachs' New York headquarters on Tuesday. Esther Beke was one of them. Beke said her mother, Rebecca, lost her battle with cancer last year. The family couldn't find chemo therapy treatments in Venezuela due to severe medical shortages, so Beke's relatives had to send the medicine from Colombia, which created a logistical nightmare for the family. Beke, a visiting instructor at the Pratt Institute, says she believes Goldman's investment won't help alleviate chronic shortages that her mother faced. "You know when a company like Goldman Sachs provides money, it's not going to be for that, it's going to be to buy bullets, to buy tear gas and to keep killing people," says Beke, wiping away tears. "This idea that there isn't any medicine for anybody, it's heartbreaking." Beke's family tragedy is a part of Venezuela's spiraling humanitarian crisis. Its citizens face shortages of food, medicine, electricity and clean water as Maduro's regime runs out of money. Venezuela only has $10.8 billion in reserves left. Its reserves rose by more than $400 million on Thursday after Goldman's purchase, according to central bank data. So far, Maduro has prioritized paying its global bondholders over feeding its people. Food imports were down 50% last year. Venezuela grows little of its own food after the government nationalized much of the farmland, then abandoned managing it. Instead, it focused on exporting oil, its only source of revenue. The average Venezuelan living in extreme poverty lost 19 pounds last year due to food shortages, according to ENCOVI, a polling firm in Venezuela. President Trump summed up the crisis recently. "What's happening is really a disgrace to humanity," Trump said on May 18. Trump's administration recently applied economic sanctions against the Maduro-backed justices in Venezuela's Supreme Court. It also put sanctions on Venezuela Vice President Tareck El Aissami. Latin American leaders and international organizations have lambasted Maduro for abandoning the country's democracy. Goldman made its investment against that backdrop. It's not the only Wall Street bank facing criticism over a Venezuela investment. Harvard professor and former Venezuelan leader Ricardo Hausmann urged JPMorgan last week to remove Venezuelan bonds from its emerging market index. Many mutual funds and ETFs buy JP Morgan (JPM)'s index on behalf of millions of Americans with 401(k)'s and other investments. Hausmann said JPMorgan (JPM) should take out Venezuela's "hunger bonds" from its index and create an index that "would allow you to root for higher returns on your savings without wishing for human misery." JPMorgan declined to comment. A source close to the bank said its emerging market bond index is a reflection of economic data and cash available in financial markets, not a country's policies. Other indexes managed by Citi (C), Barclays (BCS), Morningstar and Bank of America (BAC) have Venezuelan bonds in their indexes. Some investors who focus on Latin America investments also expressed their disappointment over the Goldman purchase. Although Goldman didn't buy directly from the government, experts say the immediate increase in Venezuela's reserves indicates Goldman's money went straight to Maduro's coffers. "I find what Goldman did morally reprehensible," says Russ Dallen, managing partner of Caracas Capital, an investing firm in Miami. It doesn't own any Venezuelan government debt.